A five-person panel is in the process of reconsidering how the Advisory Committee on Shareholder Responsibility “can be most helpful to the Corporation and the community in general,” Kirk D. Kolenbrander, Vice President of Institute Affairs and Secretary of the Corporation, said on Tuesday. President Susan Hockfield testified before a House of Representatives committee on energy on Wednesday, making the case for tripling federal funding of energy research. 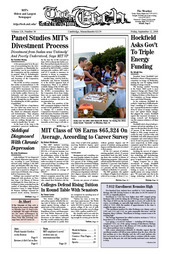 The MIT students receiving Bachelor of Science degrees in June 2008 were offered a mean salary of $65,324, a 6.9 percent increase over last year, according to data from the preliminary version of the MIT Careers Office’s 2008 Graduating Student Survey. The consumer price index rose about 6.2 percent over the same period of time, according to the Bureau of Labor Statistics. Aafia Siddiqui ’95 was diagnosed with chronic depressive type psychosis, according to court documents released today. Siddiqui is the MIT alum and Brandeis PhD who disappeared mysteriously in Pakistan in 2003, and is married to alleged terrorist Amar Al-Baluchi, who is being held at Guantanamo Bay.